Some of our strength to fight evil comes from our experiences in the past, from the encouragement of others, and from our knowledge of the truth in the Scriptures. Ultimately, however, our power comes from God's mighty power. Paul uses his letter to the Ephesians to remind Christians that this power is what raised Jesus from the dead (Eph 1:19-20). Through that power in us, God can do much more than we can ask or imagine (Eph 3:20-21). Most important of all, as we put on our spiritual armor and dedicate ourselves to spiritual discipline, God blesses us with his power and might. 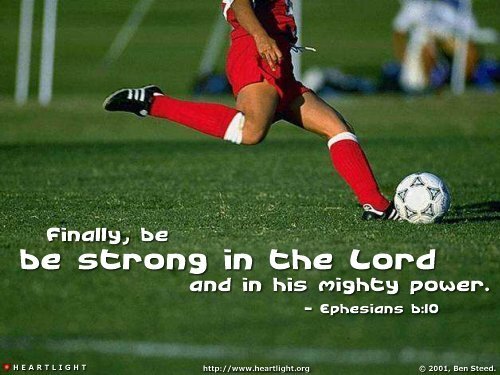 We can be strong in God's mighty power.